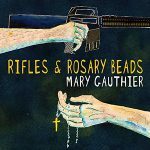 We’re delighted with the response that Mary Gauthier’s new album, Rifles & Rosary Beads, has been getting in the press and from fans. The new album features eleven songs co-written with and for wounded veterans as part of the five-year-old SongwritingWith:Soldiers programme. Participants of the programme have shared that the experience of songwriting was life-changing for them, some even said life-saving. Something about writing that song — telling that story — is healing. What program co-founder Darden Smith calls post-traumatic-growth. Find out more about Rifles & Rosary Beads here. You can read a selection of the review quotes for the new album below.